Hey! Did you know you can make slow cooker meatloaf? It’s true! You can make meatloaf in the crockpot. Why would you do that? Well, sometimes you just don’t want to turn your oven on (think summertime). Or maybe you just need to make food ahead of time instead of right at dinner time. Or maybe you need some cushion on when you actually eat dinner and turning the slow cooker on gives you that cushion because even if you’re a half hour late the food isn’t going to burn in the slow cooker like it would in the oven! There’s so many reasons to use your slow cooker. I used ground turkey for this meatloaf, but you can use a lean ground beef if you prefer. I just mix the ground turkey with a few ingredients and shape it and put it into a bread pan. If you’re using a 6 quart oval slow cooker (the most common size) a bread pan should fit right in there. Then I turn the slow cooker on and forget it about it for several hours! When I made this meatloaf I used a separate slow cooker to make baked potatoes. Making baked potatoes in the slow cooker is simple. Just wrap the potatoes in foil and put them in the slow cooker for 6-8 hours on low. 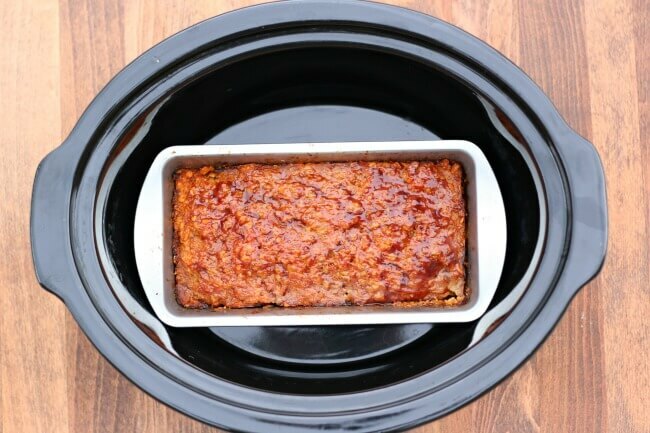 An easy recipe for slow cooker ground turkey meatloaf. A traditional dinner that everyone loves! In a bowl combine the turkey, tomato sauce, oatmeal, onion, salt and pepper. Use your hands to mix well. Shape the mixture and place in a bread loaf pan. Place the pan inside your 6 quart oval slow cooker . Cover the slow cooker and cook on HIGH for 4 hours or on LOW for about 6 hours. 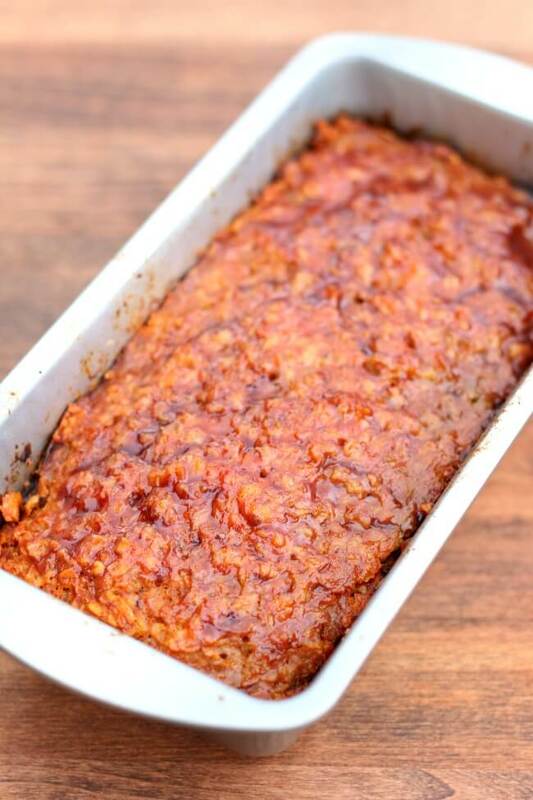 Brush the top of the meatloaf with some bbq sauce and then place in the oven on broil for 2-3 minutes. This step just makes it look a lot more appetizing and browns up the top a bit! To make gluten free: Oats do not naturally contain gluten but are often cross contaminated in the fields they’re grown in. Be sure to use certified gluten-free quick oats. Bobs Red Mill is a common brand. Want more slow cooker recipes that use ground turkey? Here are 16 recipes that use ground turkey in the slow cooker! Today will make the third time I’ve used this recipe. I love how easy the clean-up is from making it in a loaf pan. Thanks for the great idea! can i use bell pepper and egg and , ketchup instead of tomato sauce. ketchup and brown sugar on top. I’m sure you could! And I bet it would taste great. Do you need to put water in the bottom of the crock pot? No you don’t need to. Do I absolutely HAVE to use quick cook oatmeal? Or would bread crumbs work fine..? I am so excited to hear I can use the crockpot! I have a question, I usually use 2 pounds ground turkey for my meatloaf for plenty of leftovers, how long should I cook this size loaf on low & on high??? Hi Tina, I would say low for 6 hours or on high for 4 hours. Good luck! So this will work If you don’t have a loaf pan and just place it in the actual crockpot as long as it’s lined with tin foil? Yes I believe that would work just fine. my loaf pan fits, but snuggly against the inside walls of my crock pot…it does not touch the bottom of the crock pot… is this going to work? Thanks, I want to make this so much, its simple and sound lovely. If I cooked this in the oven instead of the crockpot, what temperature would I put it on and for how long? I always use pesto sauce in my turkey meatloaf. Think it would be good in crockpot? I mean it should still taste the same…maybe better?? Any advise? 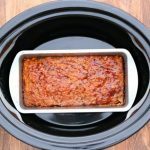 Can I put a glass loaf pan in my crockpot? i made this in the oven. At the end i put the broiler on put the bbq sauce on it. It was good.next time i am going to try it with salsa instead of bbq sauce. Oh yes, salsa would be so good! so this would work if I line the pot with foil for the entire time it cooks? This is SO intriguing, Karen! I have a smaller, round slow cooker, so I’m not sure I’d be able to pull this off, but I’m loving it! Maybe you could make a mini meatloaf! Yum – thank you and have a good weekend!